"Cowboys," "vaqueros," "gauchos," each of these words conjures a different image, yet all these occupations originated in the Salamanca and Old Castile region of twelfth-century Spain where cattle herders wore low-crowned hats, bolero jackets, sashes, tight-fitting trousers, and spurred boots. The dress of gauchos, vaqueros, and cowboys may have originated in Spain but new articles of dress were added because of the various environments in which cattle herders performed their work. The dress of all three changed because of innovations in ranching culture and in technologies used for producing clothing; however, there is one characteristic that still remains among all three groups-their love of flamboyance in dress. The dress of gauchos reflected the influence of Spain while responding to environmental conditions found in South America. Nineteenth-century paintings show them wearing low-crowned hats, vests, and bolero jackets, all having Spanish influence. They also wore calzoncillos that bear a remarkable resemblance to petticoat breeches that were fashionable in sixteenth-century Europe. Chiripá that consisted of loose diaper-like pants were worn over the calzoncillos. The gauchos of Argentina and Chile added ponchos that originated among the native people of the region for protection from cold winds and rains generated by the Andes Mountains that rose above the pampas. During the colonial period, Argentinean gauchos wore bota de potro, boots made of the leg skins of colts. By the nineteenth century machine-made boots replaced the bota de potro since Argentineans enacted laws forbidding use of homemade boots to prevent the killing of colts. The most elaborate part of traditional gaucho's dress was a wide belt called a cinturon, trimmed with coins and fastened with a large plate buckle. By the mid-twentieth century, the calzoncillos and chiripá were replaced by wide-legged trousers called bombachas tucked into tall leather boots, but the cinturon remained a traditional part of gaucho dress. Gauchos in the twenty-first century still resemble their early-twentieth-century ancestors, since they are dressed in low-crowned, broad-brimmed hats, short jackets, bombachas tucked into tall boots, and, most important, cinturons decorated with coins and wide plate buckles. Some gauchos still use ponchos, both for decoration as well as for protection. Vaqueros of Mexico, the most direct ancestor of the American cowboy, also wore clothing that resembled the clothes worn in Spain, though there were differences. The low-crowned hat, bolero jacket, sash, and spurred boots remained, but a new form of dress developed in the North American Southwest. Armas were an early form of chaps made of slabs of cowhide hung from the saddle and folded back to protect a vaquero's legs from the thorny brush that was part of the New World environment. Chaparejos that fully enclosed a rider's legs were the next practical evolution of protective gear for Mexican vaqueros. By the late sixteenth century, vaquero dress included a leather chaqueta or jacket, a sash, knee breeches called sotas that were usually made of leather, long drawers visible under the sotas, leather leggings that wrapped to the knee, and spurs attached to buckskin shoes. Vaqueros, too, changed their dress to reflect changing technology and culture. By the mid-nineteenth century, their dress consisted of wide-brimmed, low-crowned hats, short jackets, thigh-high chaparreras tied to a belt at the waist that were worn over trousers, boots and large rowelled spurs. The twenty-first century vaquero wears chaparejos that resemble those developed over 400 years ago but he wears a broad-brimmed hat with a higher crown trimmed with a fancy hatband and ready-made shirt and pants. Woolie chaps, made of leather with the hair left on, originally developed in California, were introduced to northern cowboys by vaqueros who drove cattle from Oregon to Montana mining camps during the 1860s. They did not represent cowboy culture until the cattle industry had expanded to the northern plains during the 1880s when woolies, as they were called, were particularly useful for protecting cowboys from the cold that was a part of northern plains life. Eastern visitors to the West still sometimes buy flamboyant cowboy gear but they are more likely to do their horseback riding in running shoes and T-shirts instead of cowboy boots and satin shirts. One reason for this is that most dude ranch visitors no longer spend six to eight weeks on western ranches summer after summer, but visit a dude ranch for one or two weeks once in a lifetime. Cowboy dress is important in American culture, especially to those who live in the West. 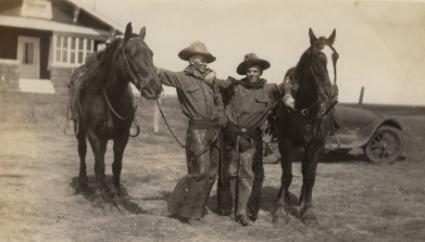 Often formal events are excuses for westerners to put on their best western outfits consisting of broad-brimmed Stetson hats, western-cut shirts with curved yokes and pearl snaps, tooled belts with fancy plate buckles (or trophy buckles if available), tight, boot-cut jeans, and high-heeled boots. Even ladies dress up in their best Native American jewelry, well-cut western shirts, full skirts, and high-heeled boots. Western style is hard to resist. "He was dressed like a Wild West Show cowboy, with such … extras as … a bandanna worn full in front like a lady's big bertha collar, instead of tied tight around the neck to keep dust out and sweat from running all the way down into your boots." Bronco Billy Anderson, a real cowboy who starred in The Great Train Robbery. Cary, Dianna Serra. The Hollywood Posse. Boston: Houghton Mifflin, 1975, p. 17. Gauchos, vaqueros, and cowboys are important in South and North American folk culture. All three represent fierce independence and self reliance but it is their clothing and gear that defines each group. Gauchos are recognized by their tall boots, wide-legged pants, coin-decorated belts, and wide-brimmed hats. Vaqueros wear sombreros that have decorated high crowns and very broad brims. They still wear chaparreras and boots and fancy spurs, but their pants and shirts are more formal than those worn by their ancestors. Cowboys often wear Stetson hats that have broad brims, bright-colored shirts, and blue jeans that are now part of the cowboy image. Slant-heeled cowboy boots, spurs, and tooled belts with fancy buckles are also part of the cowboy image. Rodeo cowboys now wear chaps made of leather embellished with Mylar in bright colors like shocking pink and turquoise that flash in the sun as the cowboys demonstrate their skills in the arena. Although gauchos, vaqueros, and cowboys can trace their origin to Spain, little in their appearance reflects the dress of twelfth-century Salamanca. Instead, each wears the clothing that developed because of changes in technology and culture. See also America, Central and Mexico: History of Dress; North America: History of Indigenous Peoples' Dress; South America: History of Dress; Boots; Fashion and Identity; Men's Hats; Jeans; Protective Clothing. Bisko, Charles. "The Peninsular Background of Latin American Cattle Ranching." The Hispanic American Historical Review 32, no. 4 (November 1952): 491-506. Cisneros, Jose. Riders Across the Centuries: Housemen of the Spanish Borderlands. El Paso: University of Texas, 1984. Dary, David. Cowboy Culture. Lawrence: Kansas University Press, 1989. Slatta, Richard. Cowboys of the Americas. New Haven, Conn.: Yale University Press, 1990, p. 34. Taylor, Lonn, and Ingrid Marr. The American Cowboy. Washington, D.C.: Library of Congress, 1983. Wilson, Laurel. "American Cowboy Dress: Function to Fashion." Dress 28 (2002): 40-52.